The Gluten Free Bar is a HIT! 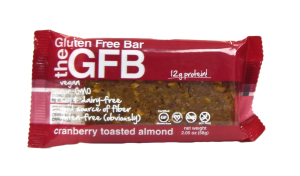 With a base of California almonds, this bar has a whopping 12 grams of protein. The taste is sweet both from the cranberry and agave. It actually tastes slightly cranberry – a pleasant surprise. The bar is a smooth texture and is creamy. Each bar is 225 calories, 9.5 grams of fat – with 18 grams of sugars both naturally occurring from the fruit and from added sugars. Very satisfying.